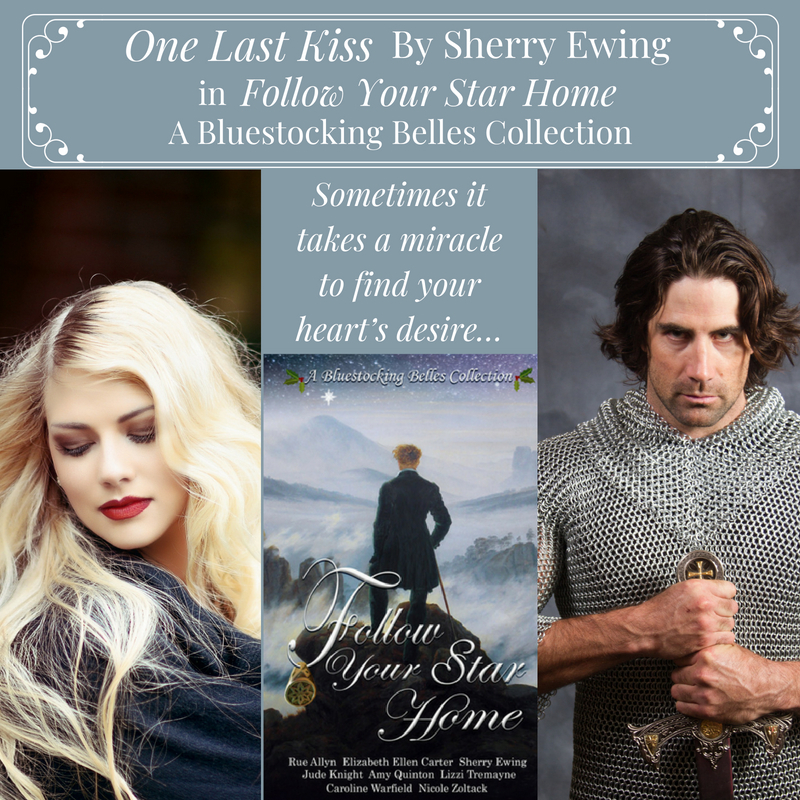 Today on First Kiss Friday, I’d like to give you an excerpt from my medieval/time travel, One Last Kiss: The Knights of Berwyck, A Quest Through Time Novella which is my contribution to Follow Your Star Home: A Bluestocking Belles Collection. When I had the opportunity to write a time travel for this year’s Belles anthology, I jumped at the chance because… you know… I love a good time travel, don’t you? 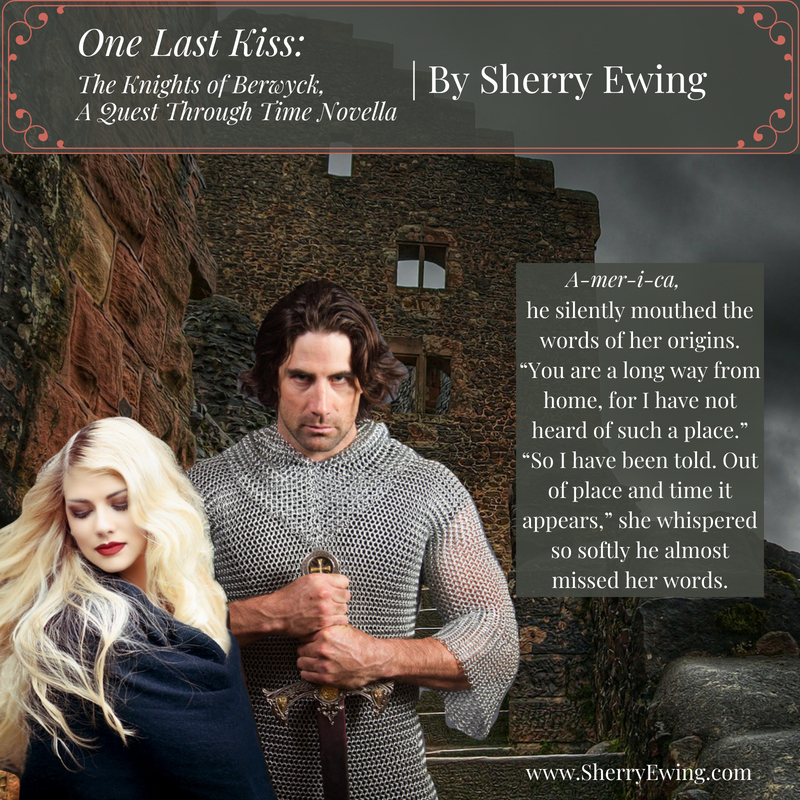 Enjoy this first kiss scene with Jade, a modern day woman, and Thomas, one of my Knights of Berwyck. Happy reading! Jade was unsure what madness had overcome her to be kissing a man she barely knew, but, in many ways, she felt as though Thomas had always been a part of her. Crazy as it may seem to even have such thoughts, she gave in to the invisible energy surrounding and pulling them together. The moment their lips touched, everything changed. Where before she felt as though she were being forced into something she didn’t want, now, it was as if this was where she was always meant to be. With Thomas… in his arms… kissing him with all the love she could muster up for another human being. Their kiss ended just as quickly as it had started. Their breaths ragged, they could only stare into each other eyes. Thomas reached down to caress her cheek, and a sense of wonderment filled her, knowing she had truly crossed time. He gave her a half smile as though he had heard her thoughts before he leaned down to taste what she now freely offered. It was as though they were now in control of their destiny. Thomas deepened their kiss, and she heard his moan of pleasure even as she held back one of her own. It wasn’t as if she hadn’t been kissed before, but there was a reason she had remained single for so long and not married right out of high school like so many had done. No man had ever stepped into her life that seemed to be the other half of herself or just the piece of her that had been missing. She had sworn to herself she would never settle, but with Thomas, she had an instant connection she knew she would never find again in any other man. In an instant, the universe tilted as though they became as one, almost as though Zoe’s words pulled them together from across the centuries. As though she watched the scene in a movie theater, his arm wrapped around her waist, and he held her even tighter, bending her over. He made her swoon as no other man had ever done before. Her hand reached up and took ahold of his hair. Gosh, she never wanted to let him go. Emptiness surrounded her when he abruptly tore his lips from hers and pushed away from her. The cooler air of the room coming into contact with her flushed skin caused her to shiver. He muttered something, possibly in Gaelic, giving Jade the impression he was of Scottish descent. But whatever his words meant, Jade couldn’t understand any of them. He began to pace the room, much like she had done but moments before. She went to him and gently laid her hand upon his arm. “What’s the matter?” she asked, almost afraid to hear his answer. He stared at her hand for several minutes until his words exploded from his lips. “St. Michael’s wings! Where did you come by this?” he growled out before taking her hand and inspecting the ring she couldn’t seem to get off her finger. He began to pull at the shiny gold band, but it wouldn’t budge for him any more than it had moved for her. Roughly, she tore her hand from his. “Stop that. You’re hurting me,” she shouted. “I did not mean to cause you harm, but how came you by this ring?” he questioned again, his frown deepening. Gazing down at the object of his concern, she held the ring close to her chest, hugging her hand as though it was wounded. If anything, the jewelry was her one way to return home, or so she guessed. She could not let him have it. Not at any cost, no matter the thoughts that had just gone through her head about the two of them belonging together. His angry stance told her much, causing her thoughts to jumble around inside her head. She almost laughed out loud at the absurdity of her whole situation if it were to be believed. Time travel? 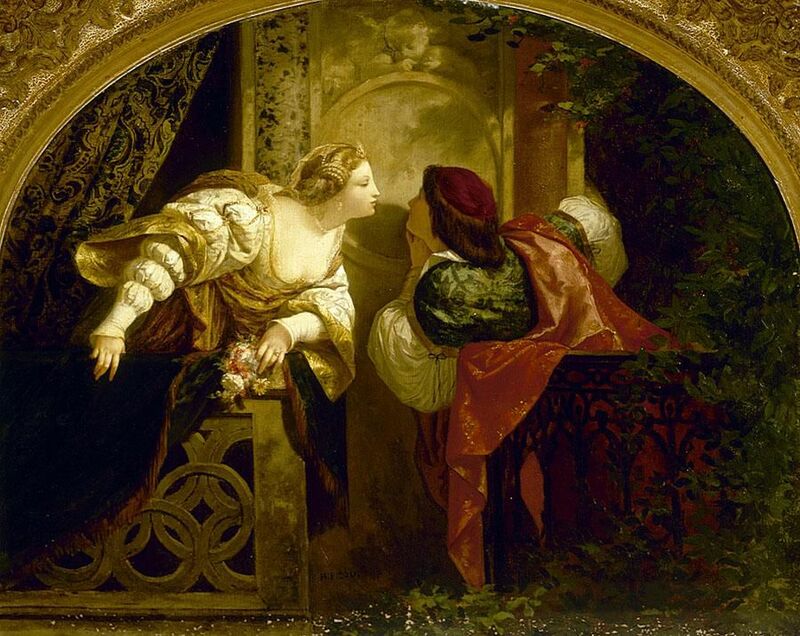 Please… Yet how could she possibly wrap her head around the fact she appeared to be in some bedchamber in a medieval castle, let alone come to care for a complete stranger with just one kiss? 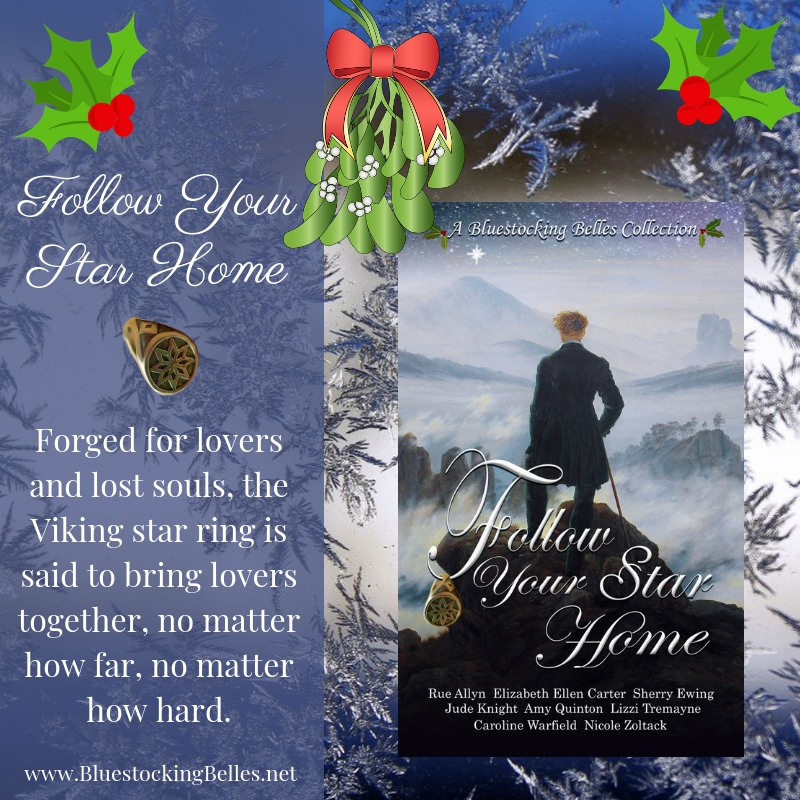 Follow Your Star Home is available now. 25% of the proceeds benefit the Belles’ mutual charity the Malala Fund. Welcome to our last Medieval Monday for this round. This theme was Author’s Choice. If you’ve been following along for the past 13 weeks, were you able to guess at my theme? Be sure to leave me a comment to be in the running for this themes giveaway. 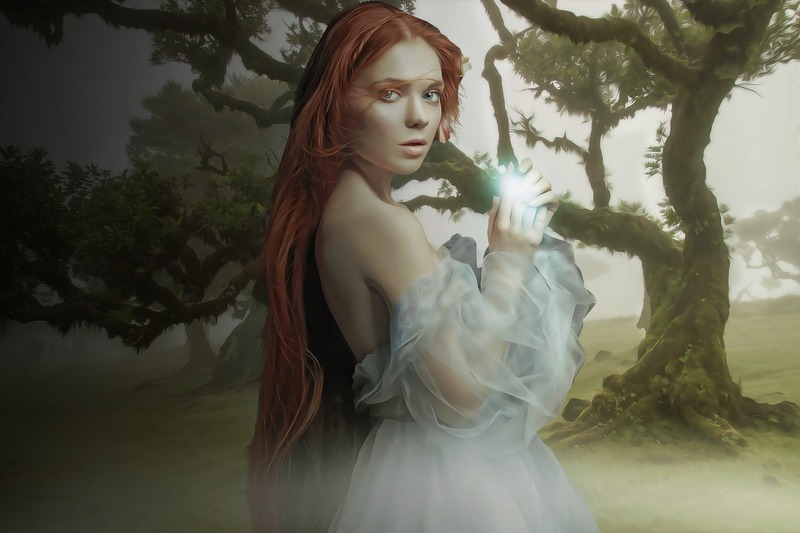 Here’s the last snippet for Only For You: The Knights of Berwyck, A Quest Through Time Novel (Book 2). “Ha! You obviously haven’t heard about the fury of a woman scorned,” she replied sourly. She took one last glance at Riorden before she reluctantly left the hall without him. A feeling of unease overcame her. She had the notion the green eyed monster of jealousy would be rearing its ugly head to taunt her far sooner than she would have expected! ’Twas taking everything within him not to smother that delicious mouth of hers in another searing kiss. “A man cannot be called beautiful, my lady,” Riorden managed to choke out. Katherine stopped her fingertips and laid her palms fully upon him. He sucked in his breath yet again, when she leveled her exquisite bluish-green eyes on him. “Oh, but you are…” Her words trailed off and hovered between them. She gave a tiny smile that could only be termed intimate before she continued touching him. Happy Valentine’s Day to all my lovely readers! As a romance writer, today is a day I celebrate the happily ever after’s I’ve created for my characters. This day is all about love and happy couples. If you’ve read my work, you know I’m all about pulling my characters apart before I bring them together. Sometimes it’s the villain, whether male or jealous female, or Time itself that creates the obstacle. But no matter what is driving my plots forward, you can be sure that by the time you reach the last page of my books, you’ll have a big sigh moment and maybe even shed a tear or two that love has won the day. 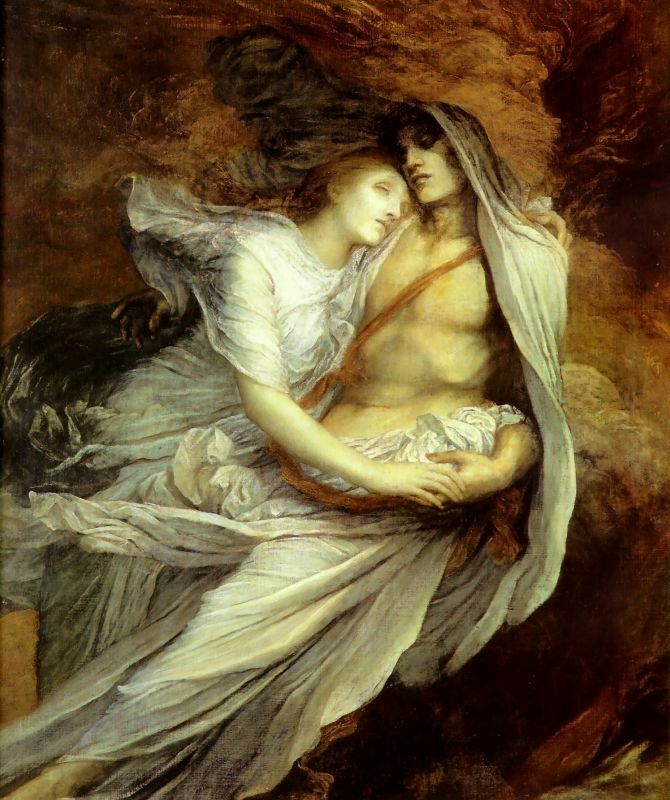 Lovers throughout time have had their images painted to reflect the mood of the romance they hold dear to their hearts. As an author, I’ve had my own ups and downs when it comes to cupid’s arrow. 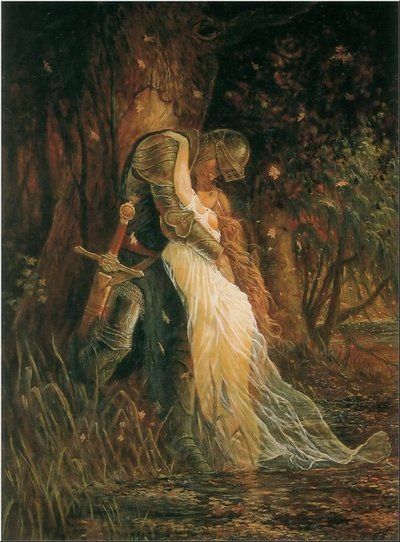 Until that next knight in shining armor finds me, I continue to have hope that his armor hasn’t turned to rust and he’ll turn up when I least expect him. 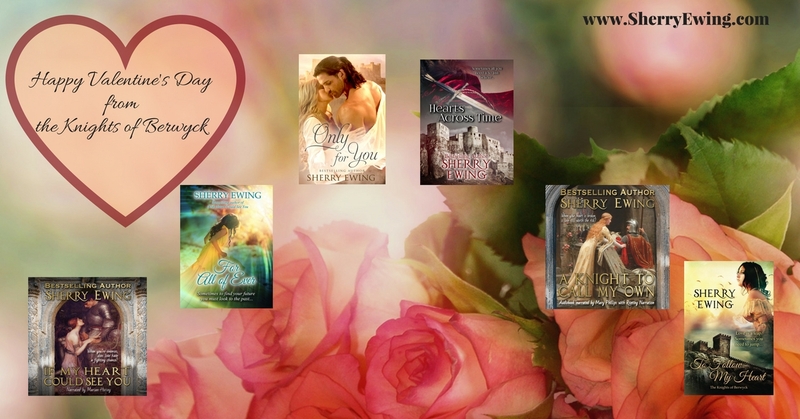 So until we meet again between the covers of my books, my Knights of Berwyck and I wish you and yours a very Happy Valentine’s day. You can find all my books on the tab above. Read them all for #FREE in #KindleUnlimited! Welcome, Time Travelers, to 1181. 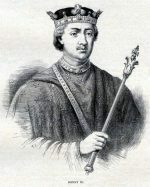 Henry II (1133-1189) is king of England in 1181, and he’s part of the good news. He’s building up our court systems and seems to be very big on the rule of law, something that may catch on. 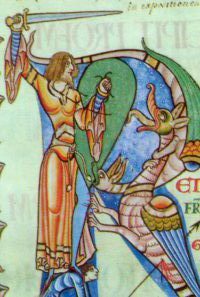 He and Eleanor of Aquitaine (1122-1204) had eight children but of course they haven’t all lived to adulthood. One who did is known as Richard the Lionheart (1157-1199). Unfortunately, several of them have led revolts to secure the succession and are eager to acquire power and lands. Their mother, Eleanor is one of the wealthiest and most powerful women in Western Europe at this time. Henry II might be called a ruthless ruler in his determination to restore the lands and privileges of his grandfather Henry I, but he has done a good job of strengthening England’s borders with Wales and Scotland. He’s also used the country’s wealth to fund a long-running war with his rivals in France. 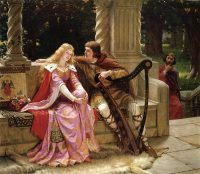 The tale of Tristan and Iseult is one of the favorite tales at this time. 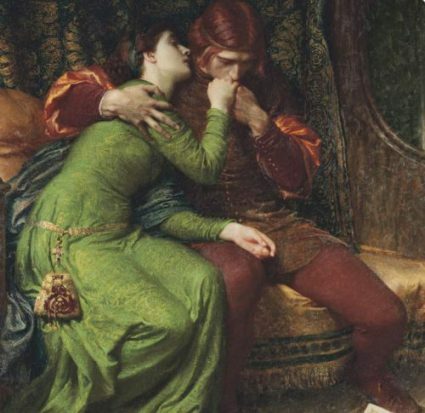 The story is a tragic one about the adulterous love between the Cornish knight Tristan and an Irish princess Iseult (Isolde). 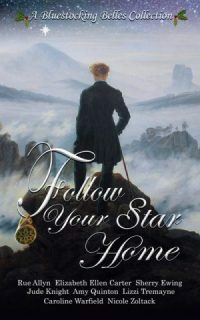 However terrible the ending to their story, we love it and believe it will have a substantial impact on Western art and the idea of romantic love. My characters in The Piper’s Lady are members of the nobility and what they eat is far different from the food of commoners or even kings. They eat plenty of fresh game seasoned with exotic spices and display refined table manners, and have wine on a daily basis. 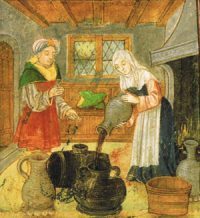 Their servants and the lower classes drink ale or mead. Meals are usually a communal affair and my Knights of Berwyck gather in the Great Hall for their meals. We care about fashion in 1181, just like your own time. Men wear an inner tunic or shirt with long tight sleeves and drawers or braies. Tailored cloth leggings called chausses or hose (separate garments for each leg) are often worn with an outer tunic that reached to their knees or ankles. A recent innovation the surcoat has been well received and is worn by both men and women. The knights in my story, wear chainmail to go to war or practice in the lists. Full body armor, which you might think of when envisioning a knight in shining armor, won’t be introduced until later. 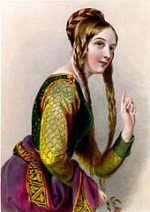 Women wore an under tunic called a chemise (usually made of linen), over which is worn one or more long tunics (or gowns/kirtles). A close fit to the body, full skirts and long flaring sleeves are characteristic of my characters in The Piper’s Lady. 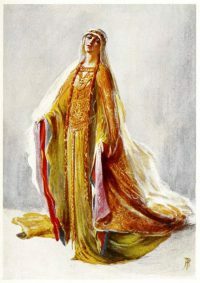 They also wear a veil over their hair that was often parted in the center and hung down in long braids. My characters from The Piper’s Lady live in a castle called Berwyck located at the England/Scotland border. 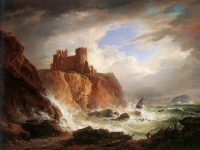 Note: although there is in fact a castle located at Berwick-Upon-Tweed, little remains of it in your century as the foundation was torn down to build other structures in the area during intervening centuries. As an author, I decided to change the spelling of the castle name and, as my time traveling ladies will attest, the castle will still be thriving in the future. Comment on all eight blogs in the tour and be entered to win a $25 gift voucher from Amazon and a print copy of Never Too Late! You can get to all eight blogs via the time machine page on our Bluestocking Belle’s website once all tour stops are published. 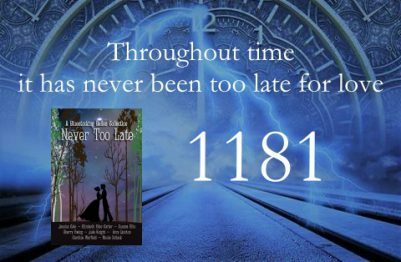 Next week you’ll slip through time and find yourself in 1324 via Nicole Zoltack’s blog here! Fare thee well, time traveler! Try not to land in the midst of the Black Plague, the Great Fire of London or the sack of Rome! 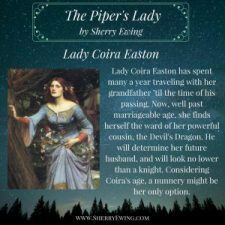 Lady Coira Easton spent her youth traveling with her grandfather. Now well past the age men prefer when they choose a wife, she has resigned herself to remain a maiden. But everything changes once she arrives at Berwyck Castle. 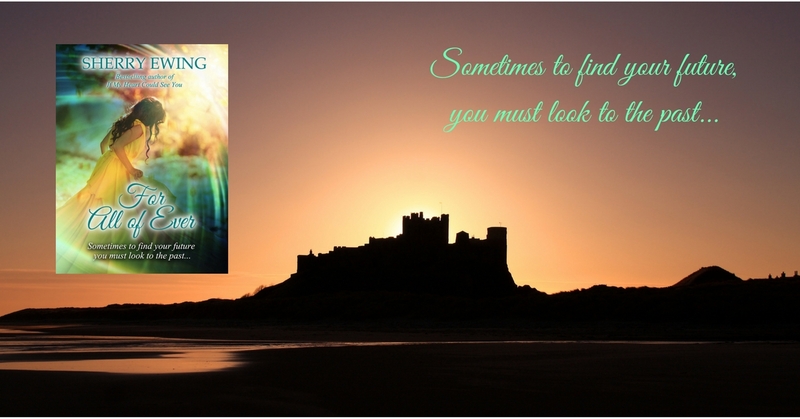 She cannot resist a dashing knight who runs to her rescue, but would he give her a second look? 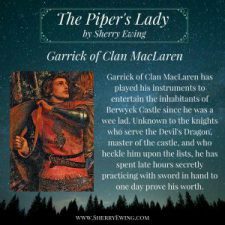 Garrick of Clan MacLaren can hold his own with the trained Knights of Berwyck, but as the clan’s piper they would rather he play his instruments to entertain them—or lead them into battle—than to fight with a sword upon the lists. Only when he sees a lady across the training field and his heart sings for the first time does he begin to wish to be something he is not. Will a simple misunderstanding between them threaten what they have found in one another or will they at last let love into their hearts? #MedievalMonday ~ Final chance at our Giveaway! Hello Gentle Readers and welcome to Medieval Monday. This week is a last chance to enter our First Encounter giveaway that we’ve been holding for the past several weeks. If you’ve missed out on posting comments on any of my snippets, here’s your chance to do so. The more you comment, the bigger your chances to win. We’ll choose a winner next Monday for all the books featured in this theme. Everyone loves #FREE books, right? 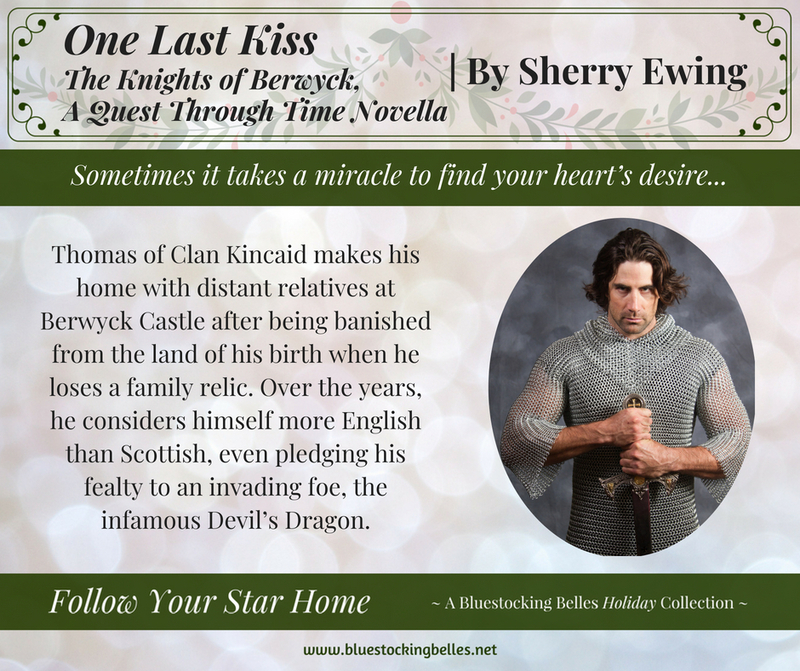 Here’s a recap of my excerpts and who’s blog they can be found on for my medieval & time travel novel, FOR ALL OF EVER: THE KNIGHTS OF BERWYCK, A QUEST THROUGH TIME NOVEL and good luck! 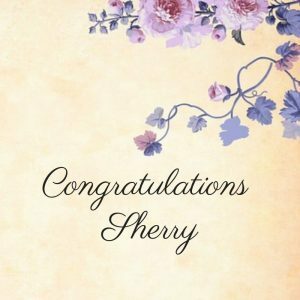 Medieval Monday with yours truly, Sherry Ewing & a Giveaway! 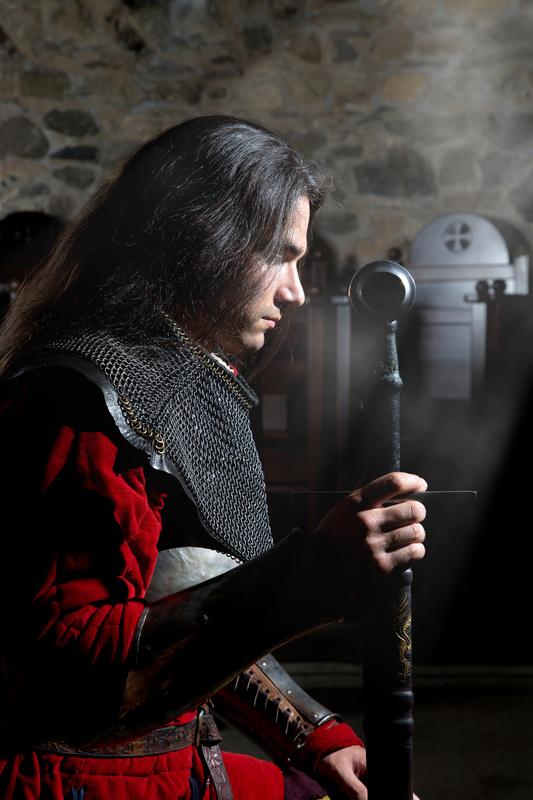 Gentle Readers: Today ends our First Encounter theme for Medieval Monday and instead of a small snippet, I’m going to give you the remainder of the chapter from FOR ALL OF EVER: THE KNIGHTS OF BERWYCK, A QUEST THROUGH TIME NOVEL (Book One). It is my hope that you’ve enjoyed this theme and getting to know the writing of some incredible medieval authors. Thanks to all who participated and the winner will be announced soon. 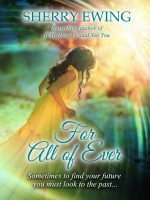 So, without further ado, I bring you my excerpt from FOR ALL OF EVER. Remember to leave me a comment here on my blog so you can up your chances at our giveaway. I hope you enjoy this excerpt as much as I had writing it. Happy reading! “You don’t understand…” the ghost began, but Riorden held up his hand to halt any further words. She nodded her head, as if she finally understood his words to leave him be. But ’twas the tears coursing down her cheeks and the look of grief in her eyes that made him realize he had erred in not trying further to help her cause. He took a step forwards, but ’twas too late to offer her what solace he might afford her. He could already feel her slipping from his side. She slowly backed away from him. “Oh God… I don’t even know your name,” she sobbed across his mind, and was gone. “Katherine!” Riorden rasped out, for he felt an unfamiliar loneliness creep upon him as she vanished, yet again, afore his eyes. For one brief instant, when he had watched her crying, he had felt a connection to another he never thought would find him again. Her disappearance left him feeling bereft and out of sorts. Confused with his inner thoughts, he could only stand there in a daze. At least, he could tell himself he knew her name. Merde… what had he done?